The masters' team: top: Jamieson DeCubellis, Leslie Craven, Jonathan Chatinover. Bottom: Jennifer Passafiume, Sharon Pearson, Rainy Goodale. 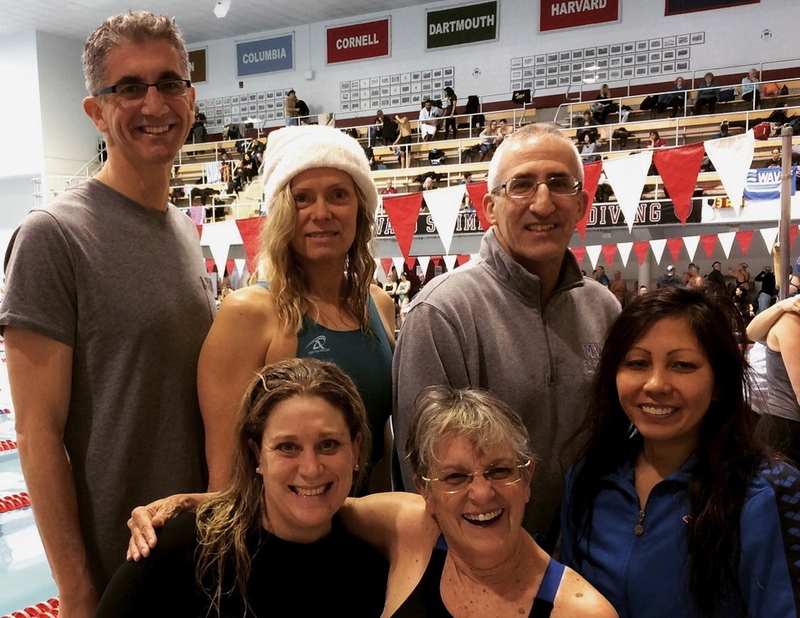 The Martha’s Vineyard Masters Swim Team, affiliated with the Martha’s Vineyard YMCA, took second place in the small team category and 18th place overall (out of 75 teams) at the New England Short Course Championships held at Harvard University. The four-day meet spanned two weekends and included 800 participants. Rainy Goodale (45-49), who also serves as coach of the YMCA Makos and Masters, entered 12 events, winning seven of them, with two seconds and two thirds. Ms. Goodale holds nine New England records and will be competing in the National Championships April 27-30 in Riverside, Calif. In the 1650 freestyle event, Liz Fox (60-64) and Leslie Craven (55-59) finished second, Jonathan Chatinover (55-59) finished fourth and Jen Passafiume (30-34) finished eighth. Greg Mone (40-44) swam three events on Saturday, and set Vineyard Masters records in all three (50 breast, 100 individual medley and 50 free). Leslie Craven, YMCA aquatics exercise leader and assistant high school swim coach, swam in 11 events, with two second places, three thirds and two fourths. Jennifer Passafiume, YMCA swim instructor and triathlon coach, swam in nine events and set personal bests in eight of them. Sharon Pearson, the senior member (70-74 age group) of the team, entered four events, won two and finished second in the other two. Jonathan Chatinover swam 13 events; he had one second place and two fourths. The Vineyard triathlon is Saturday, Sept. 8 beginning at 7 a.m. with a swim at Inkwell Beach.